Evelina Thompson won an award for her contributions to the Developing for the 80s campaign. File consists of: RTA Awards Ceremony programmes; photographs of award winners from 1992-1995 and 1997; and a cassette tape from the 1974 awards event. The files contain nominations and award winners for Ryersonian of the Year and Professor of the Year.A VHS cassette tape, Women, Food and Families, 1999, 67 mins., by Judy Paisley and Jennifer Welsh. 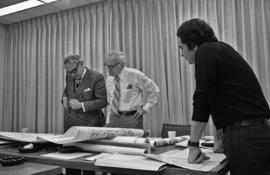 Photographs of men looking at architectural plans on boardroom tables. 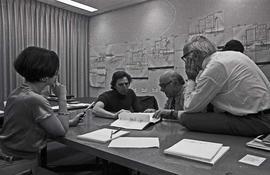 Views of men at a boardroom table judging entries for the Canadian Architect Yearbook Award. Photographs of men looking at award entried on board room tables. 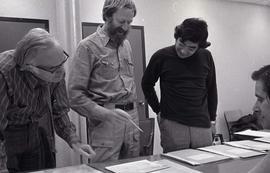 Photographs of men looking at documents, judging for the Massey Award. 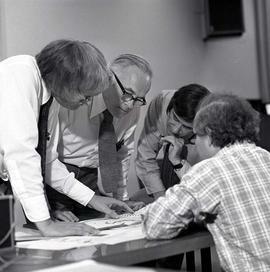 Photographs of men looking at plans on a desk. The file consists of award ceremony programs listing the student names of those placed on the Dean's List and recognized for achievements in individual courses. File contains programs relating to the annual awards presentation. Awards night programs and (blank) nomination form. Pierre Juneau O.C., LLD, 1996 award recipient, John Barba-Linardo Lombardi 1997 award recipient, Robert Lanto 1998 award recipient. File consists of copy prints of winning photographs from the Kodak International Newspaper Snapshot Awards. Captions are enclosed with photographs. Studio photographs of a selection of Canadian Architect Magazines with awards. File contains awards and certificates granted to Kodak Canada for its community initiatives, membership in various organizations, and adherence to various standards. File contains an invitation and program to the Kodak Tribute to the World Film Festival and Prix Livernois award ceremony, held on August 30, 1999 in Montreal, QC. Program to the event includes a Kodak 100 commemorative centennial pin. Folder contains photographs of the Food Hall and Cafe Square in the Square One Shopping Centre, Mississauga, Ontario. Includes both b&w and colour prints of various interior views and architectural details of the Food Hall and Cafe Square. A framed certificate awarded to John Griffin for his camera work on "Just Another Missing Kid" - a documentary created for the Fifth Estate. Mr. Griffin is an RTA alumnus. Series consists of award materials related to the School of Disability Studies. Item is a print featuring an image of three men and one woman holding up an award for presentation. Presumably featured in Kodak News. Vol. 30 No. 1. File contain a two page report on the state of bursary and loan needs for Nursing Students at Wellesley Hospital. Nominations and winners for the Dedicated Service Awards. Announcements of Distinguished Service Award winners. 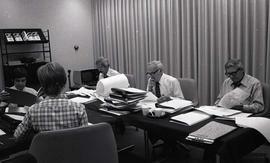 File consists of nomination requests, forms, and winners of the Career Achievement Award.